To tell a rhyming story in under 500 words is both a skill and an art. 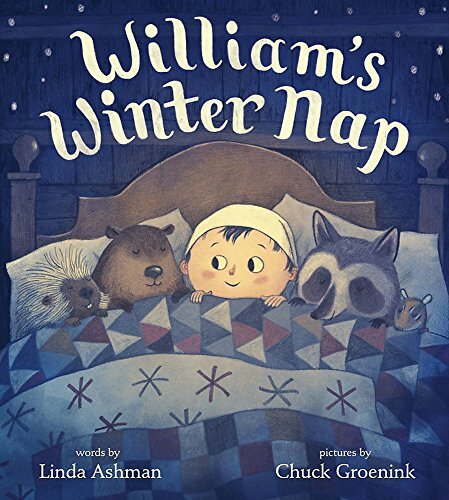 Linda Ashman demonstrates both in her newest book, William’s Winter Nap. Six animals knock on William’s door and window, or slip a note over the threshold, asking to come in. The first four woodland animals, Chipmunk, Porcupine, Beaver, and Raccoon, fit into William’s bed with no problem. They ask so nicely, too. Everyone is happy until Bear asks to come in, because he’s lonely. The four guests object, but William insists there is room. The bear realizes he won’t fit and tries to leave. The four guests reconsider and finally see things William’s way and invite the bear back inside. The repeating refrains of “Yes, we’ll scooch a bit,” “I’m sure we’ll fit,” “They all climb in and curl up tight/They yawn and say, good night, good night,” will become favorite lines for small voices. This is the kind of book a child can easily memorize with multiple readings plus cues from the pictures. The language Ashman uses is sparkly: scooch, a smidge, curl up tight, too squished, and we can’t consider it. The suspenseful page turn for the bear is a book designer’s dream come true. No matter who thought of it—the author, illustrator or art director—it becomes the high point of the story when the animals realize who is asking for a spot in William’s already crowded bed. The bear, as tall as the doorway, is a big surprise at the page turn. As the animals line up by height in in the doorway (except Chipmunk who is on William’s head) to send Bear away, Chuck Groenink shows angst on their faces. No, they don’t want Bear in their bed, but yes, they do feel compassion for him. Groenink’s warm brown, blue, and black winter art with touches of reds, oranges, and yellows is at its best on the last two spreads, one showing how the bear is taking up too much room, and the last one showing how they all work it out (Chipmunk curls up on the bear’s head). Creams and whites are used as light, effective against the dark navy canvases. The whites of the animals’ and William’s eyes and the creams from the lanterns, windows, and clock face pop against the night colors. The endpapers are snowflakes on navy blue, so the whole presentation looks like a winter gift. The yawning animals and William in his tasseled nightcap are delightful. The cozy cabin touches such as the dried flowers hanging on the wall, the framed silhouettes of previous owners, perhaps, the patterned quilts, the mysterious dried meats hanging from the rafters, the stone arches, the paned windows, the headboard, the mantle, the lantern, the paneled walls, and the traditional furniture give this story a timeless feel, as though it happened 200 years ago or yesterday. Charming and joyful, emphasizing compassion, done in 450 words and 23 pieces of art, William’s Winter Nap is perfect for toddlers and preschoolers learning to share.